An affair of some sort at the Br. Henry Virgil Memorial Gymnasium, which at the time did not even have the name yet. In the picture are the late Mr. Amado Mia (left) and Br. 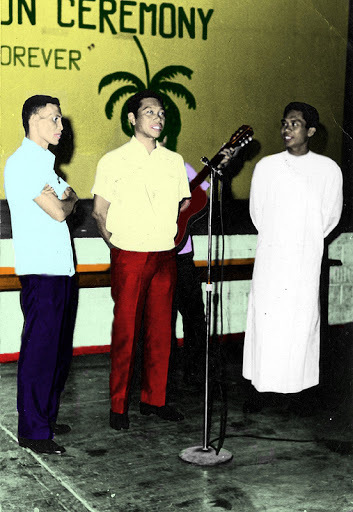 Crisanto Moreno (right), both of whom passed away just recently. In the middle is the late Fr. Zoilo Umali, who used to live with the Brothers as the school chaplain and passed away in the eighties if memory serves me right.